Mr. Badger is thrilled to meet Blossom, a flower fairy, in the garden. He flies away with her to help the fairies build a playground. But then it's complicated: the fairies won't use cement; and Mr. Badger wants to learn to fly. Join Margaret Moody for a gentle tale based on European fairy lore. Best for ages four and up. 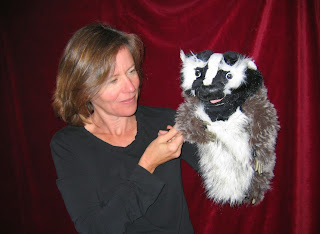 "Badger Meets the Fairies" features puppets and sets built by Sandra Pastrana and Margaret Moody and a music score created by Alison Plante of Berklee College of Music. Please stay after the show for puppet-play -- and coffee for grown-up friends. Join masterful puppeteer Deborah Costine for classic stories told with shadow puppets -and a gentle touch. Tomorrow opens this season's "Saturdays with Puppets" at Arlington Center for the Arts. Come for the show, and stay for puppet-play and coffee afterwards. Reservations? email galapagospuppets@gmail.com or call 781-643-1228 before 8am on Nov. 8.